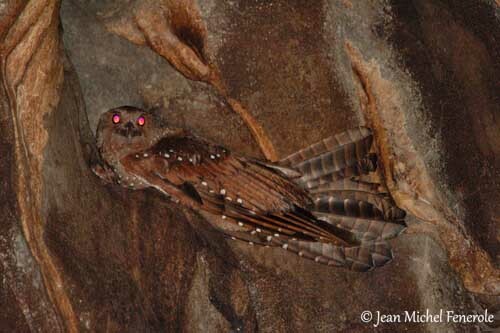 Oilbird is related to Nightjars. It has reddish-brown plumage with narrow black bars and scattered white spots on long tail, wings, head, nape and breast. Underparts are paler. Tail feathers are stiff. Wings are broad and long. Head is slightly paler with fine white spots. Powerful beak is hooked and blackish. It has very developed stiff rictal bristles. Eyes are yellowish to reddish-brown. Short legs and small feet are pale reddish-brown. Legs are placed far forwards. Both sexes are similar, with female smaller than male and male greyer than female. Juvenile is darker than adult, with the same scattered white spots. 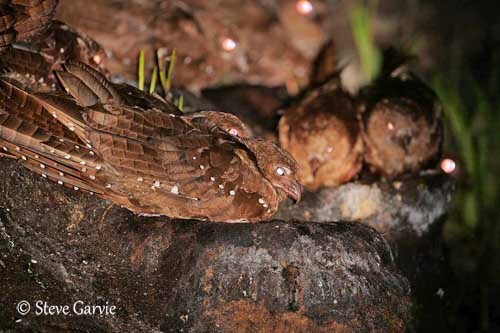 Oilbird is a nocturnal species. It feeds on fruits, mainly of the Oil Palm (elaeis) and tropical Laurels. It forages by sight. It uses its strong bill to pluck fruit while is hovering in the air. This bird never perches. They feed at night in large flocks, often travelling very long distances (100 to 150 km) from the cave to the trees offering their preferred fruits. These fruits are aromatic, and it is possible that Oilbirds locate them by their developed smell. They pluck the fruits while hovering, and store them into their stomach, waiting for come back to the cave to digest them during the day. They digest the fleshy portions of the fruit, and regurgitate the stones. They consume about 24 different species of fruits, about 70% of their diet. 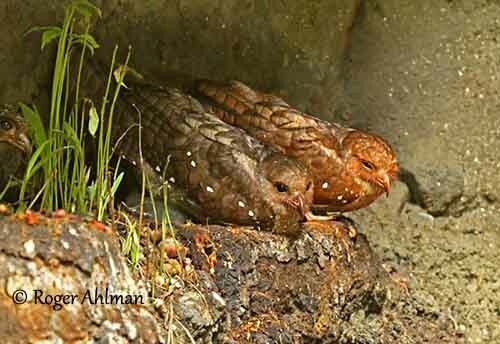 Oilbird may migrate seasonally between different caves. Oilbirds often live in pairs all year round. They seem to be monogamous, with permanent pair bonds. They may defend strongly their nest, but other nests may be located very close. Breeding occurs in rainy season, but may vary from place to place, according to fruit resources. 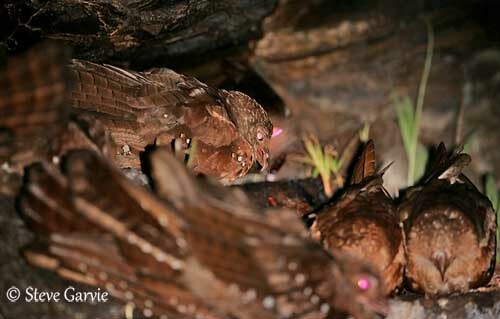 Oilbird can fly with a speed of 20 to 25 km per hour. They fly in caves by echolocation in the darkness. They are able to perform hovering and twisting flights, in order to navigate into restricted areas in caves. 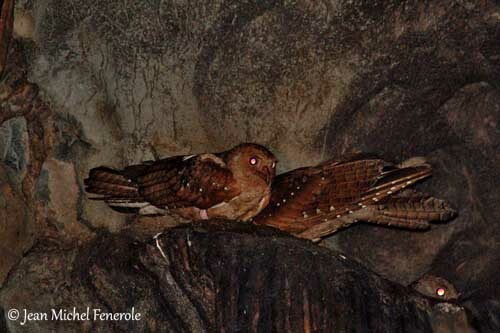 Oilbird is a nocturnal bird which navigates by echolocation, also called biosonar. The bird utters calls and listens to the echoes in order to locate or identify objects. Oilbird utters a sharp “click” in this case. It also gives various harsh screams in caves. They utter these same raucous calls “carr-carr” or “cuc-cuc” while entering or emerging from the caves at dusk. 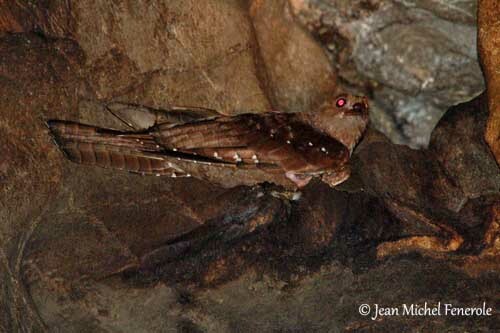 Oilbird lives in cave ledges during the day. It roosts and breeds in selected caves used since numerous decades of years. They can be found from sea level to 3400 metres of elevation. They need evergreen lowlands and montane forests to feed year round. RANGE: Oilbird lives across most of parts of northern South America, and southwards from Peru to Bolivia, and also in Trinidad. At 70 days, they are similar to adults, with shorter wings and tail, but their weight reaches about 600 grams, about 50% more than adults. At this time, parents feed them at lower rate, and youngs lose weight, and when they fledge, they have adult weight. 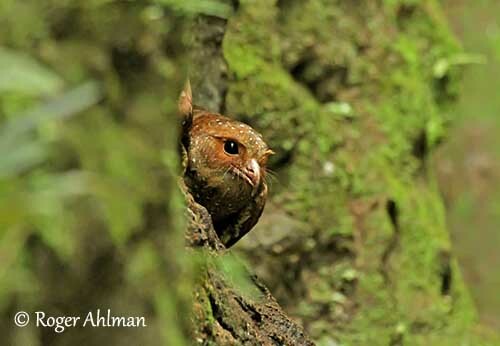 Oilbird feeds mainly on fruits of Oil Palm (elaeis) and tropical laurels. Oilbirds are widespread, but locally distributed. Threats include poaching of nests and feeding areas destruction with deforestation. Species is protected in several parks and areas in South America. 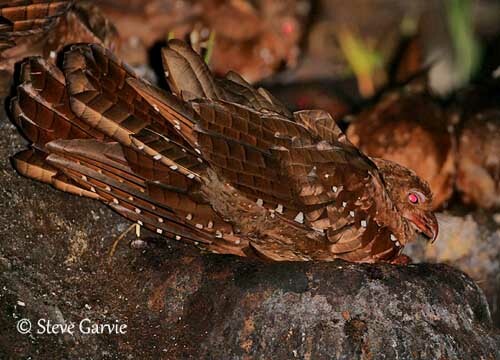 In the past, Oilbird nestlings were killed by Venezuelan Indians, and their oil was used for lamp oil and cooking. Caves where Oilbirds live form a particular ecosystem with great quantities of seed fallen on the floor and pieces of fruits. 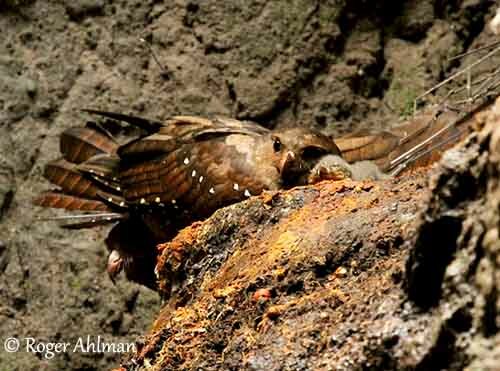 Oilbirds breed in caves, at places without any penetrating daylight. They breed in total darkness and in colonies. This species is strongly gregarious, with colonies of up to 10 000 birds. They spend the day sitting on their nests or perched on rocky ledges. They awake just before dusk, and become very noisy while waiting for the darkness. At this time, they leave the caves to forage and feed. They use their keen nocturnal vision and their smell to find food. They grab fruit while hovering, and swallow them whole. 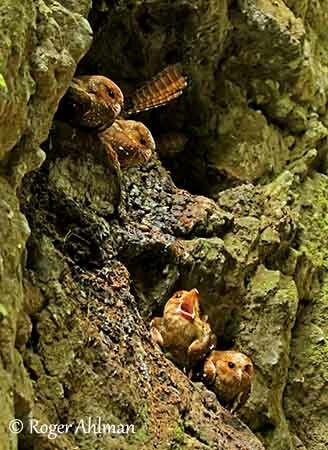 Oilbird’s nest is located on ledges, at about 30 to 60 feet above the floor of the cave. Sometimes, they may nest on the ground. Nest is made with regurgitated plant fibres, compacted into a firm paste. It is a cylindrical mound of about 16 inches in diameter. They nest in large colonies, often at good distance into the cave. Female lays 2 to 4 white eggs, at intervals of 2 to 5 days. Incubation lasts about 32 to 35 days, by both parents, and begins with the first egg laid. Altricial chicks are pinkish, naked and with closed eyes at hatching, and they have an egg tooth. Chicks are fed by both adults, with oil-fruits, but they grow slowly and they leave the nest at about 110 to 120 days of age. It is actually just a small ravine so daylight comes down here and no flashlight is needed nor is flash needed when taking pictures.